“I never see so many round-eyes”, a young Vietnamese girl exclaimed during a refreshment stop on the Ho Chi Minh Highway. We were the first group of foreigners to travel on this newly constructed highway, apart from a few Hanoi-based expatriates. Locals in the hinterlands of Vietnam stopped what they were doing to watch as bike after bike of ‘round eyes’, most two-up, rode past them. By the time the third bike had passed, they were waving and smiling, calling to their fellow villagers to come and see the foreigners on bikes. From the back of the pack, I witnessed the commotion we caused as we travelled slowly through each remote settlement. For many in our group these eye-contact interactions with the locals, made possible by travelling on a bike, were the highlight of their trip. We (Britton Motorcycle Adventures) first travelled to Vietnam in 1997. Captured by its beauty and the spirit of the Vietnamese people, we knew Vietnam would be our next overseas destination after we started taking tours to Bali in 1999. For two and half years, we plotted and planned, reconnaissance trips were made to Vietnam, and emails flew between us, and our colleagues in Hanoi. 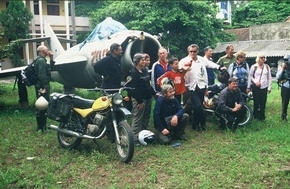 In late July this year, 15 adventurous Kiwis arrived at Hanoi airport to join us on the inaugural Venture Into Vietnam 2004 Tour. Kicking off in Vietnam’s capital Hanoi, the tour took in many ‘must see’ locations including World Heritage sights Halong Bay and the ancient city of Hoi An, former Imperial capital Hue, the Demilitarised Zone, Khe San - location for a former U.S. Army fire-base, and the Cu Chi Tunnels where the Viet Cong hid during the war. What had attracted many to the tour however, was the chance to ride down the not-yet-officially-opened Ho Chi Minh Highway. The Ho Chi Minh Highway - Loosely following the Ho Chi Minh Trail, this new highway became the focus of our journey south. Originally a series of complex parallel truck routes, and paths, through Vietnam, Cambodia, and Laos, the Ho Chi Minh Trail was used for supply lines by the North Vietnamese during the American-Vietnam War, and reclaimed by the surrounding thick jungle after the war. In early 2000, the Vietnamese Government decided to ease traffic on the heavily congested Highway One by building the Ho Chi Minh Highway to provide another route connecting North and South Vietnam. This new highway incorporates some of the roads and paths of the wartime trail, including the road through the Truong Son mountain range, an infamous northern section of the Ho Chi Minh Trail, where many Vietnamese and foreign soldiers died in the war. We travelled approximately 2300kms by bike, where possible on the Ho Chi Minh Highway, from Hanoi to Nha Trang. The Bikes – A 125cc two-stroke Belarusian motorcycle, the Minsk is considered by many to be the best bike for touring Vietnam. Tough, light (100kg), and robust, Minsks basic design means they can be fixed almost anywhere. Minsks use pre-mix two-stroke fuel, any oil will d two-stroke, four-stroke, caster oil, even gearbox oil at a pinch, just get the mix right – two small coke bottles to 10 litres of petrol! Minsks may lack a little in speed and power, but with so much to look at, going fast is not a requirement. In the rural regions, Minsks are used for everything from transporting livestock to moving refrigerators. ‘In Minsk We Trust’ is the slogan for the, Hanoi based, Minsk Motorcycle Club– which now has 15 new Kiwi members. Our mechanic, Cuong, said that in Vietnam the Minsk has the equivalent ‘cool’ status that Harley Davidson’s receive elsewhere. In Vietnam, the Minsk rules supreme. The Vietnam Crew – Travelling with us was master Minsk mechanic Phung Duc Cuong and our motorcycle guides Australian Digby Greenhalgh, and Englishman Dan Dockery. Mentioned in The Lonely Planet Guidebook, Cuong is regarded as the best Minsk repairman in Vietnam. Living up to his reputation, he repaired a broken bolt on a rear sprocket in 15 minutes, roadside, with limited tools. Cuong owns 60 Minsks, including all the bikes we rode on tour. Cuong considered the tour a holiday – his first in over four years. Usually a non-drinker, Cuong’s only regret was his hangover the morning after drinking B52 slammers (with much encouragement from the Kiwis) when celebrating the conclusion of the motorcycling leg of the tour. Dan reckons his Vietnamese is not good enough for a political discussion in Vietnamese, yet his ability to flirt en-route, with any female from 15 to 50, demonstrated great proficiency with the language. The ruoc (rice liquor) king on tour, Dan actively encouraged everyone to try the local brews that had everything from sea snake, to geckos, to goat’s foetus, pickled in the brew! Widely read on the American-Vietnam war Digby took on the role of history instructor. Most mornings, he gave lively, pro-Vietnamese history lessons, complete with map and red pen. However, residing in Vietnam didn’t prevent him from performing a taunting victory dance when the Wallabies thrashed the All Blacks! Digby and Dan own Minsks, and are founders of the Hanoi based Minsk Club. Hill tribes, haka and hongi - After leaving Hanoi our first overnight stop was at Mai Chau, with a White Tay family in their stilt house. The White Tay are one of the many ethnic groups that make up Vietnam’s hill tribes. They were to perform traditional dances and songs, and we were supposed to reciprocate. Tour organiser, Mike Britton took up the challenge, no out-of-tune warbling for his group of adventurers. So onboard a junk, in the middle of Halong Bay, Mike and a couple of cohorts tried to remember the choreography of a haka. Back in Hanoi they had to teach the rest of the men. For three days in late July in a park near our hotel, while locals gathered in the early morning to practise Tai Chi, the peace was shattered when 11 burly Kiwis rehearsed the haka. The War and The Vietnamese - No trip to Vietnam can be written about without a mention of the American-Vietnamese War, and by following the Ho Chi Minh Trail much of our travelling was through areas heavily affected by the war. Bomb craters from the war were still very evident in areas we rode through, and during construction of the Highway from Dong Hoi to Khe San engineers found over 600 unexploded ordinances per kilometre. The devastation caused by Agent Orange in the region around Khe San, and many more locations en-route, was very noticeable, even now almost 30 years later. The soil is orange and burnt-out looking as far as the eye can see, and only sparse scrappy vegetation grows. It is characteristic of the positive Vietnamese attitude that they have no bitterness towards those who fought against them and we always felt welcome in their country. Even those with deformities caused by Agent Orange waved to the ‘round eyes’ on bikes, their faces beaming with smiles. Memorable Moments – There are many great memories from our three-week journey which, supported by our photos, will stay with us forever. The beauty of waking up onboard a junk in the majestic Halong Bay at the beginning of the tour; the joy on the faces of the hill tribe people as we rode en-masse, waving wildly, through their village, and the smiles on the faces of the children when we stopped and gave out small toys to them; the picnic lunches in the middle of nowhere featuring baguettes, imported cheeses and meats, and unusual Vietnamese herbs; the luxury of the Morin Hotel in Hue and The Rex Hotel in Saigon that gave us the chance to act above our stations; the four-lane-wide concrete Ho Chi Minh Highway where workers filled the joins with liquid tar using small kettles; and the new friends made, to name just some. Yep, it was a great trip, and lucky me, as one of the organisers I get to take another group of ‘round eyes’ down the trail again next year; excellent!